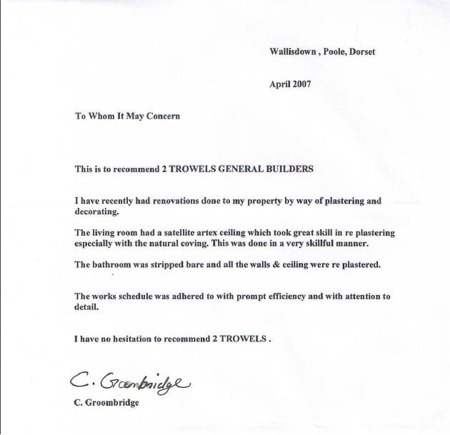 Welcome to 2Trowels : for all your quality plastering and general building needs around the Bournemouth, Poole and Ringwood areas. 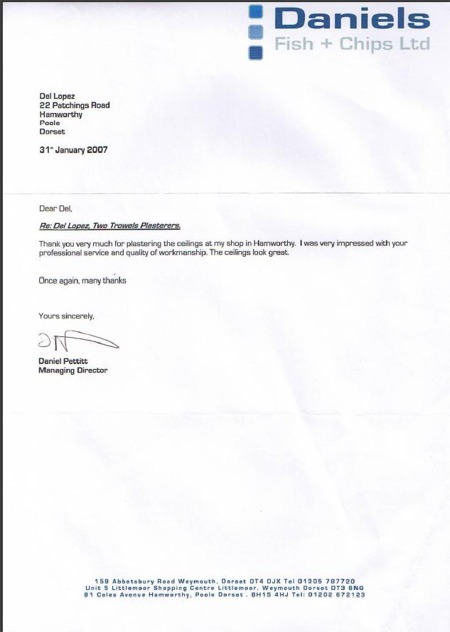 Below are a few of the letters and comments we receive after we have completed the job. As you can read, we try to exceed our customers expectations! "I contacted Two Trowels as I was worried about the plaster in my kitchen, I also needed the ceiling fully re-plastered. I have to say the standard of service was exemplary, firstly they explained exactly what was needed. I was then given several choices as to finish etc. I was then given an estimate, which was extremely competitive. I am particularly impressed with the standard of workmanship, not only was the plastering expedited quickly and efficiently but with the minimum of mess. My ceiling and walls are absolutely perfect which was unthinkable given the previous condition of them. In summary, top quality, courteous timely service & excellent value for money." 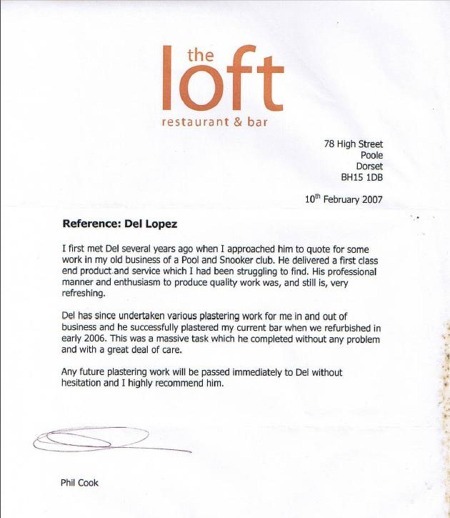 "I have already recommended Del to one of my friends. He worked hard all day plastering, resulting in a smooth as glass finish on my kitchen walls and ceiling. I found him to be a very personable young man and trustworthy. I left him in my house all day. When I came home the plastering was all done and he had cleaned up after him self. This has not been the case with other “trades men” recently. Del also made a great job of painting my Kitchen and grouting the tiles. I will be employing him again." "Del came to my home in Poole at the agreed time, got straight into the job. I was extremely happy with his work; he was very clean & tidy. I would have no problem having Del Lopez back into my home for any other building work I need doing. His prices are very competitive with a first rate service". 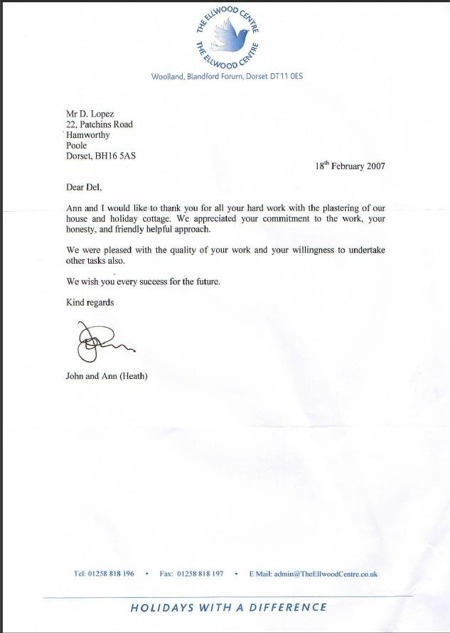 "This Tradesman, Del Lopez from above company done all the work required ,in a such a way, of which I have not seen for many years, I have served within the Building trade for many years, I have seen all sorts of results, good & bad, this guys work was really second to none. I say thanks for a excellent Job." "Great quality work done at very short notice. Turned up on time and worked really hard. Highly recommended. " "Del , is on time work's very hard and very clean always smiling ,nothing is to much ,also any time we have changed the plan he's there to help us out ,, very safe worker, think about other when doing his work always doing a risk assessment of any job ,working area always made safe over night , he told us on all work a time he would start & finished and he keep to his word, we will have him back"
He was polite, cheerful, and the singing grows on you. The work was done to a high standard and i had no problem leaving him alone in the house all day, with only the rather large mountain dog for company, I think the singing got to the dog as when he hears Elvis on the radio now, he runs for cover. I have no problem recommending 2 trowels, and i will use them again. "This young man is good helpful and a very happy natured and it shows in his work over a broad spectrum of jobs not just plastering ' 2 Towels' do most things around your home with a good sense of humour and reliability on time and value for money 10out of10"
"Del Lopez of (2Trowels Quality Plastering & General Building)is very professional with his work & was a pleasure to have in my home with his jolly nature, he is a perfectionist with his work & i would & have recommended him to others already! " 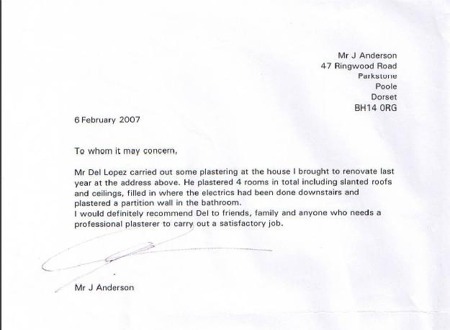 "After Del plastered my ceilings and walls in the kitchen and landings whilst we went on holiday (100% trustworthy & reliable), I asked him if he would consider rendering a garden Koi Pond! Even though he had never done one before, he came round and had a look, agreed to do it and did an amazing job! He is fun, brings his own music and gets on with it, not stopping for breaks! A genuine hardworking tradesman, now there's a rarity!" "They did an excellent job, were punctual and were a pleasure to do business with. There were no hidden extras or surprises in the price and the job was completed in the time they said it would be. I would highly recommend them and will use them again in the future." "he was very tidy done a top quality job and was always happy and cheerful "
"I called 2 Trowels for a Plastering job & was so happy with the work that I asked Del to do more . There's not many people that I would recommend, but Del ( 2 Trowels ) is one that I do... PS. he likes to sing. lol." "I came back to uk after living overseas for 18 years. Bought a house and more or less rebuilt it to high spec with Del's help. He did an amazing job on what was a lunar artex ceiling with natural coving by replastering and continued to decorate as requested. Then a badly built garden wall was demolished and concrete posts and fencing went up. He does everything to high spec with good value for money and is most reliable." Call us on 07900 412 555 for a NO OBLIGATION quote and a FREE survey*. * we a offer a FREE survey within the area shown in our area map. If you are not sure, please call or contact us. ©2Trowels 2009. All rights reserved. All Trademarks acknowledged.